This Demonstration takes a message and encrypts it by transcribing it as a list of Unicode encodings, XOR-ing the key with the plaintext, and showing the output. Though the operation is undertaken in binary, the decimal representations are displayed to conserve space. Accompanying it are sound and visual transcriptions. The sound is meant for digital transmission, not human hearing. The visual transcriptions are to be read vertically with black squares representing 1's and white squares representing 0's. The message is transcribed as Unicode encodings and displayed in the panel in decimal form. The process of encryption by XOR-ing the key and the plaintext is undertaken in binary, but only the decimal forms are shown to save space. The two visual accompaniments are representative of the Unicode encodings of the plaintext and ciphertext, as labeled. The plaintext visual are the numbers under the first tab in binary. 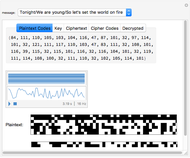 The ciphertext visual are the numbers under the fourth tab in binary. Plaintext Codes: Unicode values. "A"=65, "a"=97. 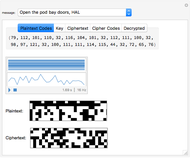 Key: Random values from 0 to 127. 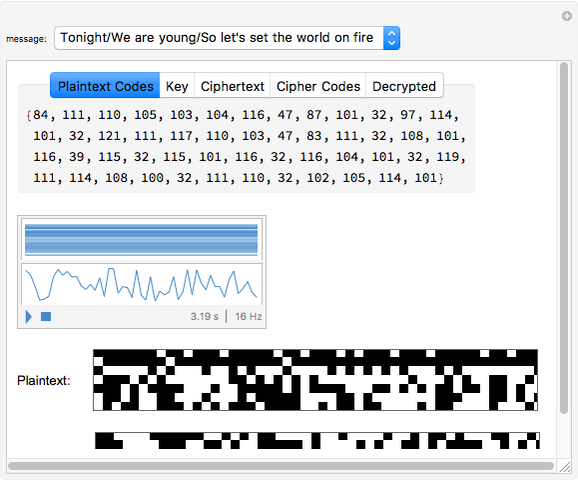 Cipher Codes: XOR of Plaintext and Key.